When Edgar came over for dinner one night, he brought over the Vinturi Aerator so that we could all try it out. It actually comes with a little felt pouch so you can bring it out with you. Isn’t that hilarious? For displaying at home, it has a little stand too. All this would be worthless if it didn’t work, but I was surprised by what a difference it makes. You just pour any red wine through, right into your glass. It makes a cool slurpy bubbly noise as it goes through, and your glass of wine breathes almost instantly. The aerating of the wine is supposed to improve the bouquet, enhance flavors, and give a smoother finish. The smoother finish is what I noticed the most so far. It takes away the bite that some wines have that make it rather harsh for light weights like me. For around $30, it’s a great gift! posted by jessica	at 04:49 PM	Filed under Products. You can follow any responses to this entry through the RSS 2.0 feed. Both comments and pings are currently closed. I gave this to my brother-in-law for Christmas and he loves it. And everyone fights to take turns using it! That’s so cool! 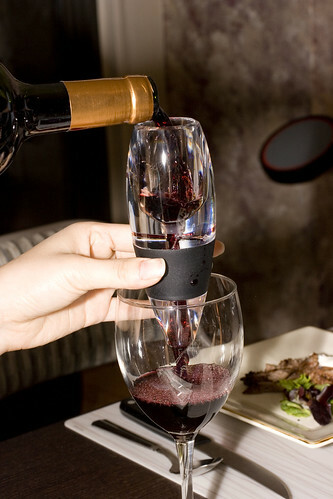 I want one – I drink a lot of shiraz and that would definitely work well with this gadget. Also, where did you get that copper peppermill in the background? I’ve been looking for one like it. That’s a cool gadget! I know a lot of people who would love this, thanks for sharing. I’m so glad you wrote about this. I saw it and wanted to get it, but wasn’t sure if it actually works. Now I have my answer. I was going to get a decanter but this is way better. So it’s like a wine filter? 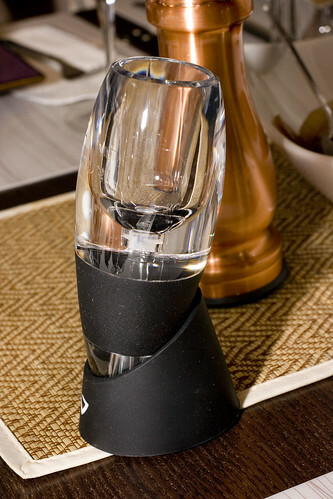 Blond Duck, it’s an aerator, which speeds up the process of decanting.